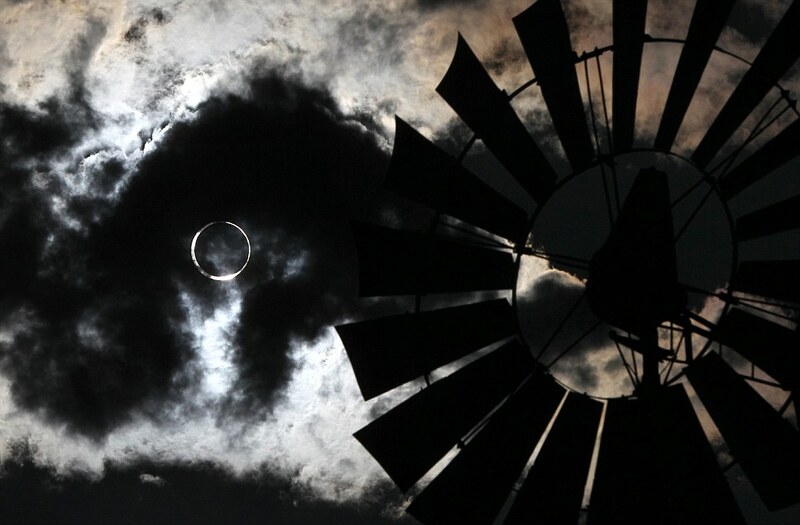 2012 Annular Eclipse | Watts Up With That? May 20, 2012 in Astronomy. Best picture I’ve seen of the eclipse! Good job! Thanks as always, Tokyoboy. Google translation here. -w.
All it needs is a “Smiley Face”. Well, maybe not. This was real. Thanks for sharing. I’m sure it put a smile on your face. Stacey, nice photo — too bad about all the driving. Return Safe. We are a few hundred miles south of Pyramid Lake, so had a “chunk out” eclipse. Just enough to feel the difference in the solar load. The sunlight is different, kind of like having light very good sunglasses on. Centered just perfectly! Middle of the track and timed just right. Great job. But seriously, the photo is sheer haunting elegance; kudos to the Missus/Miss Watts! FanTAStic photo! Well done, Stacy! Great picture, Stacey. Way to go! We now get super powers right? Bulls eye! We got rained out but I made a 2-hour time lapse of it anyway. The self-adjusting shutter canceled most of the fading light, so even that was a near-fail. That’s Seattle for you. We had our own small eclipse party in a public park in Sacramento. We saw the eclipse through a Personal Solar Telescope, through holes in cardboard presented on a back up surfaces, through crescent images in shadows from leafy trees, on fences from leaf projections, on playground equipment through holes in equipment elements. We saw it everywhere we looked. But nothing as clean and perfect as your family’s photo on the centerline. Kudos to you and yours. What a wonderful evening. Here in Pleasanton Ca. it looked really cool on the side of my home showing through the leaves on a tree, cheshire cat(s) smiling or pac-man dancing in the wind. Great! Thanks for sharing, and your children will remember it. I’m sure it was worth the effort, and the conference won’t suffer. It was with a phone, no filters or anything so it is mostly the sun, but you can still faintly see the moon on the upper left quadrant formed by the contrail and the vertical line of sunlight. There was also a gorgeous halo around the sun which showed up somewhat in the photo as well. Its a sign. Its a sign in the sky, O’s the one! Wow, quite a thick annulus obviously close to apogee. http://www.wmur.com/news/money/technology/Solar-eclipse-projects-ring-of-fire/-/9857638/13495754/-/item/1/-/lm86ebz/-/index.html that the path was ridiculously narrow. “More than 80% of the sun will be blocked out during the apex, Newmark said — but the full effect will be visible only to observers within 200 feet (61 meters) of the track.” 200 feet is wrong. In the 1994 eclipse the annulus just touched the edge of the Sun in Concord. In Plymouth it was centered. Given the perigean full Moon we had a couple weeks ago, the Moon must be at near perigee now, so perhaps the track could be 400 miles wide. Oops – I meant to type apogee. I better go fix it. Great shot! Mind if I use it as a screen background? Awesome photo. Hope the kids enjoyed it too. Outstanding photography. Well done Ms. Watts! This stuff is not easy to do. As a photog myself, but along different lines, I know how hard it is to get a shot of an eclipse — of this quality. More of your work, Stacey, would be good to see. Soooo, rub my nose in it, yah sure you betcha…. Great Job! What lens were you using? How long before we see an article claiming the number of annular eclipses have increased because, wait for it,…Global Warming? You know, not once did I have to tell my dog not to look at the Sun! Even he knew better and did not need “experts” to tell him what to do. Actually, Koko and I were working on my sailboat and trying to keep the Sun out of our eyes when this eclipse happened. I completely forgot all about it. Wow, perfect circle! Very well done, thank you for sharing it with us! Awesome, and again, good on ya for keeping a promise to your boy! I was near the far end, close to Lubbock, almost dead centerline. Watched the Big Moon God eat the Big Sun God…about a third of the way, then get blocked by clouds. Sigh….total cloud cover at the last one in these parts in ’94. Big thumbs up for you Anthony, and all those who got to see it up close and personal! Pretty good viewing from Whiskeytown Lake, CA this evening! Lots of people converged there. Did anybody sight Venus, Jupiter, or Mercury nearby? Great picture. My brother lives in Trinidad, on the coast, and he said he got a good view through the thin high cirrus of the approaching front. I thought the corona would be brighter, and the reddish color is also a surprise. I thought the corona would be yellower. Also, it’s interesting to see the red light inside the diameter of the moon silhouette. I guess that might be a diffraction effect of the sharp edge of the moon. Wow, great shot! It doesn’t get any better than this. Awesome photo Anthony and crew (assuming family). Now that’s what you would call a perfect golden ring! I also saw an annular solar eclipse and made some pictures when I was in Madrid on 3rd October in 2005. Did you notice a temperature drop while the eclipse? Really nice image, perfect time capture, perfect ground spot. What focal length telephoto was used? IIRC, the camera was one of Canon’s first digitals. Kind thoughts would say that your Stacey might hace earned a nice Christmas gift update. Do look at the new Nikon 1 V1. It’s quite amazing and affordable. Well done to Stacey Watts for a great picture and well done to Anthony Watts for taking time to be with his family, enjoy the conference! Nicely done. The timing was perfect. That is stunning! Kudos Stacey. Did you see the Moon’s shadow travelling across the ground as with full eclipse? What a pity … you’d have got a much better view if the moon hadn’t been in the way! a) Moving the sun further away … which would definitely solve global warming. b) Moving the moon closer. Which I think means that it will increase by 1% per 100million years, as the greatest eclipse is 4% overlap, that means eclipses will cease to be seen in 400million years. Congratulations on the glorious photography. I’m very interested in animal reactions (primates and other mammals, birds, insects, etc) to eclipses – whether life here on earth experiences some unique “eclipse” stress-type reaction (different from that of the sun just going down at the end of a normal day) which could indicate particular sensitivity to abnormal events at astronomical scale. You will see where this could possibly lead. Have you felt the Global Cooling? May I put it on my facebook page? I only have 38 friends (unless I’ve been defriended again). Great photo. It looks professional. Great picture. I was lucky enough to see an annular eclipse a number of years ago from my own back yard, I was about 15km off centre and observed the moon ‘roll around’ the inside of the sun. 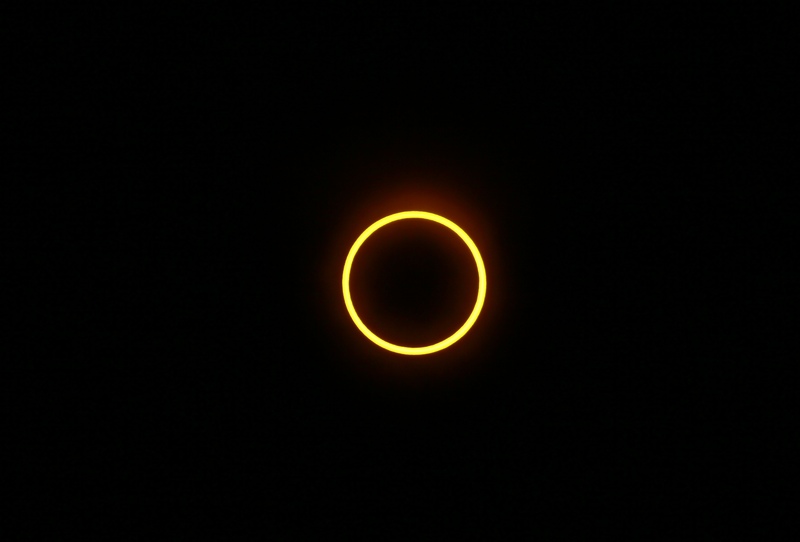 It was a 99% annular, which meant it got surprisingly dark. Stacy, I now expect a quality shot of the transit of Venus, June 5 at around sunset for all of the US. What an adventure and what a memory y’all will have. Thanks for sharing the photo. Many years ago I witnessed a total solar eclipse. Unfortunately it was cloudy where we were, however it got quite dark. We were parked along a highway near some diary cattle, as it got dark they started heading back to their milking barns. They were somewhat confused when it became light again minutes later. It was relatively late in the day, so to them the darknes may not been too unusual to begin with. I feel I felt in Tokyo a LOCAL Cooling by around one degC at least for several minutes during eclipse. Somewhat amazing. Very nice picture. it is on my facebook page with credit of course. Well, here’s another Wow! Great work Stacey! Great pic, thanks Anthony and Stacey! I’m sorry, I can’t see where the USHCN weather station is situated? Can you add an arrow to point it out for me? Is the station in all that blacktop? Surely you didn’t drive all that distance and not take pictures of the weather station? Seriously great photo! I agree it is a professional picture! I believe it stacks right with the top eclipse pictures taken anywhere! 2. The hands should be redrawn so they don’t exactly copy the hands in the WRL’s logo. 3. The wrists should be shackled to each other, indicating our defiance despite our suppressed and marginalized status. As we are talking about photos, there is an interestiing optical effect on the “North Pole” cam, on the Sea Ice page. Can anyone comment on what causes it, it doesn’t look like a glare/lens effect. Very jealous. Travelled to Devon to see the Total Eclipse of August 1999, but was clouded out. However, totality was an amazing experience. I don’t know why y’all keep misspelling “Annual”. Also, Eclipses were created by Mitsubishi. Good Lord, don’t even think it! O’s ego is too over-inflated as it is. Also, you might give his PR/campaign people an idea. Great picture Stacy. You must have been dead center on the path. Very nice Casper. I especially like the circular ground images. I’ve seen two total solar eclipses, and been clouded out of a third. One memory was of the diffraction shadows passing over just before totality. It was almost like the last flickers of a candle before the wind blows it out, and I can only imagine what primitive people thought when the sun did that. I’m looking forward to the 2017 eclipse. Absolutely fabulous image, the huge effort paid great dividends. Beautiful !!! What a wonderful world we live in. Here in Nebraska we were treated to a clear sky and a crescent setting sun with this eclipse – max coverage was about 75% just a few minutes before sunset. Very odd to see a bright red-orange crescent setting in the west. Well, I’ve seen two total and one annular eclipses. The first occurred on 11th August 1999, and it was seen in many European countries. I saw it in Hungary at the Balaton Lake. The second one I saw in Turkey on 29th March 2006, near Side, at the seaside. I was trying to make a movie, but my video camera didn’t want to work properly while totality. The light was changing too fast: from very bright to very weak, as it would be a full moon. But I managed to take some pictures applying old-fashioned photography. I couldn’t describe my emotions, and I think there is no corresponding technique for it. You must see and feel it. I also saw the diffraction shadows, but I didn’t manage to catch them. I was just too busy. I’m going to visit Casper-City named like me in 2017. It’s on the path in the central line of totality. No joke. I have not seen this posted yet, but I received this in the mail. A view of the Eclipse and grazing umbra on the earth in one shot from the International Space Station (ISS). This is one incredible picture. Spectacular if it is real. but it could be a well done photoshop. Not a cloud in the sky all day, UNTIL the time of the eclipse. :-(( Go figure. A plus.google.com page for Chet Apichet, who seems to be involved with the Nasa Solar Dynamics Observatory. A page mixed with some good photography as well as some good Photoshop. I’m going to go with the ISS eclipse twimg above as Photoshop. The size of the sun and the curvature of the earth don’t look compatible. It might be thoroughly debunked by checking the ISS orbital position at the two possible times of earth graze. My guess not so well done. First, there was no umbra, only penumbra, this look s just way too dark. Second, at 50% coverage, the brightness on the Earth would be reduced one f stop – I think the dimming would stand out much better in a photograph, but I don’t think the track would be as wide as it is here. I think the geometry is messed up too and the shadow is too far to the right. About 50 years ago I drove my young family down from NJ to Cape Charles, VA to witness a total solar eclipse. We parked near a wooded area and nearby salt-water flats that were teeming with wildlife. I recall clearly watching in amazement the settling down into the trees of numerous birds as dusk proceeded. And as the sun approached full eclipse, it seemed that all the natural wildlife sounds fell silent until the crickets started chirping. It was a beautiful, truly full eclipse, Bailey Beads and all! Soon the entire sun disappeared and only Bailey’s Beads remained, like a fiery necklace where the Sun had been? Note to Anthony — when you took that magnificent photo, was there too much of the sun showing so brightly that the Beads went the way of Daedalus’ son Ikarus, or maybe even Phaeton? This looks great, centered and no blurring. This is what my son and I saw from about 12 miles North of Pioche, NV. We used a 2″x4″ Shade 14 welder’s glass that was near impossible to find in LA/OC. Then held it right in front of a tripoded Canon SX260HS (Powershot) pulled up to 50x up to 80x. Sure took a while to go from 5:21pm local to full annularity at 6:33pm. I began to doubt it was going to center at all. Glad we all shared the adventure. Except that Nasa Public Relations Office is totally clueless about what to put on their websites. I agree, the Apichet image is computer generated. Neat concept though. It was visible in a THUNDERSTORM in Gardenerville (NV) and 15 miles north it was a total DUD! Nothing. I feel really cheated. Usually the air temperature drops by 7-10°C while max phase. If air is moisture enough, the clouds may be formed. The temperature dropped by 6.8°C. A coworker of mine, who lives in Folsom, Cal, just sent me a photo of the shadow the eclipse caused. Mighty wild. Thousands of perfect images of the crescent limp of the sun, as it peering around the moon, reflected on the ground. Absolutely perfect photo. Hope you children enjoyed the experience. Saw it at the Parowan Gap with the family…but my cell phone camera just gave a blob of light. Thanks for the picture! Just to followup on my previous post, here’s some more pictures plus a “behind the scenes” of the Solar Eclipse from the Republic of Boulder. My friend and I photographed the eclipse from Lahontan State Park, Nevada, right along Hwy 50 a bit south-southeast of Pyramid Lake. Not quite on the centerline but easier for us to get to. Here is an animation of the eclipse. Images are 4 minutes apart and about 30 seconds apart during the annular phase. Here’s my photo, showing the sunspots too. More photos in my Flickr album including a sunset over the rocky hills west of Blythe, CA with the sun still partially eclipsed as it went down. Very cool to see! Great job by Stacey, BTW! My favorite thing during the annular eclipse in the Midwest in 1994-95 was the shadow left by objects on the ground from the annular illumination. The shadows of leaves from bushes a few feet off the ground were stunning… as the eclipse occured, the leaf would have 1 shadow, then several until finally a ring projection onto the ground of mulitple leaves. Stunning! So how many watts per square meter are reduced by an annular eclipse at its max? A .gif of the eclipse from GOES-15. We drove several hours to be in just the right place for the ring of fire. Excellent views from Shasta Lake, California area. Well worth the trip. Did not notice any unusual animal behavior. Unlike a total eclipse, it was still very bright outside during this annular eclipse. In fact, given how little of the sun was still showing, it is remarkable how subtle the change in lighting was. There was some change in brightness definitely — like the Sun had gone “weak” or like you were wearing sunglasses, but not at all dark. Indeed, there were a few other people milling around the park who seemed completely oblivious to the whole thing. It did get a bit cooler during the greatest extent, but, again, unless you were paying attention you might not notice it — kind of like it gets a bit cooler when a cloud passes in front of the sun. To Almah Geddon, the1pag , climatereflections (and, in the earlier Data and Images thread Smoking Frog who described the German Shepherd dog he saw in totality): many thanks for your observations which were very interesting and essentially matched my own experiences from the total eclipse of August 11 1999 (Saros 145) at 10.15 UT that I saw in France, and the annular eclipse (Saros 147) of May 31 2003 at the 4.00 UT sunrise that I saw – through a sea mist! – off the east Scotland coast. Thinking about it a little more I was struck by the comment from climatereflections: “Unlike a total eclipse, it was still very bright outside during this annular eclipse. In fact, given how little of the sun was still showing, it is remarkable how subtle the change in lighting was … there were a few other people milling around the park who seemed completely oblivious to the whole thing.” In the total eclipse I saw in France I also noticed that it remained surprisingly light right up to the last minute – literally – before actual totality. Bearing in mind (a) that the day only goes truly dark in a total eclipse (otherwise I agree it is indeed just a “subtle change in lighting” during an annular or the partial stages of an eclipse, (b) without effective filters or viewing apparatus no animal (or human) can look directly towards the sun to see the encroaching moon during the partial stages; (c) I don’t think simple confusion (cattle thinking its milking time when it gets dark so heading back to base, or birds thinking it’s early bedtime) can be thought in any way unusual; (d) total eclipses in any given location are extremely rare (land areas in the UK saw about 6 minutes of totality throughout the whole 20th century (1927 in Wales and 1999 in Cornwall), and will see just 2 minutes of totality (2090, Cornwall again – it must be something in the beer) in the 21st century, so it will be very rare for any particular animal to notice an eclipse during its lifetime – I have decided my earlier idea (see my posting up-thread) is essentially impractical, and cannot yield any informative results. My thanks, however, are due to Anthony for allowing me to float the idea for any comments. How is it that people look straight at the full sun when the moon is nowhere near it. Well of course they look away quite quickly; but I know I have looked at it many times. No I don’t recommend doing it; much easier to just look at a pin hole image or many of them formed by the leaves of a tree; (actually the gaps between those leaves. But that very well timed photo, looks almost like one of the rare shots on one of my small bore (22)shooting targets. If you shot ten of those on a sheet, they would score you ” a hundred ten “. Well actually only 101, because you got 10.1 for putting the 22 round through the inner bullseye, and leaving the white ring (0.25) intact. well that was way back in high school when I was 16 and could see the target. (no optical aids aloud). I believe I shot a hundred ten three times. Some of the kids on the team did it routinely. Yes you only shoot one round at each target on the sheet, plus two on the 11th target for aiming. Maybe it was looking at the sun that screwed up my eyesight, and my shooting. Dad, I remember that! I remember a drive, but didn’t know we drove that far! I remember that you made us some sort of pinhole box, right? I also remember that all the birds got confused and started flying around, squauking and roosting in the trees. There was some change in brightness definitely — like the Sun had gone “weak” or like you were wearing sunglasses, but not at all dark. Indeed, there were a few other people milling around the park who seemed completely oblivious to the whole thing. It did get a bit cooler during the greatest extent, but, again, unless you were paying attention you might not notice it — kind of like it gets a bit cooler when a cloud passes in front of the sun. If I remember correctly, sunlight is around 100,000 lux. A cloudy day is 1000-10,000 lux and you can still think it is light at around 10lux (possible to read). Just looking at the elipse, I would guess around 1-4% of it was still showing. That is 1000-4000 which is a cloudy day. Most people don’t notice such a “small” change in lighting. Another gif showing the moon’s shadow during the eclipse. Pretty cool stuff. > Here is an animation of the eclipse. Images are 4 minutes apart and about 30 seconds apart during the annular phase. Cute, though I can’t resist noting that “4th contact” is the least observed interesting astronomical event.